Women's Original Waterproof Rubberized Hunting Coat is rated 4.8 out of 5 by 20. Consulte nuestra Política de privacidad para obtener más información sobre cómo manejamos y utilizamos su información personal. Rated 5 out of 5 by LJ-MN from Fantastic Rain Coat Bought this coat is gray and it is the best, the color matches so many outfits and looks snappy with Hunter boots. The coat structure was a bit loose but that allows for arm movement. The thicker rubber also makes for an excellent rain coat because it helps to block the wind/cold. Rated 5 out of 5 by KinnyLee from The Fort Knox of raincoats I absolutely love this raincoat. 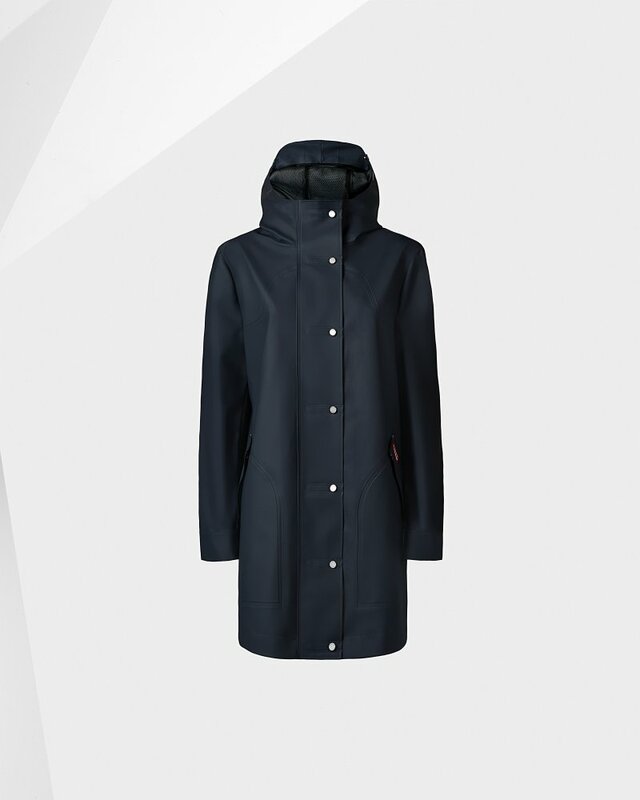 I was looking for something that I would wear while walking my dog in the torrential rainfalls we've had this winter and this fits the bill. Every inch that is covered by this coat stays dry. The hood is amazing, it has a couple of snaps on top that secure it in place so the hood isn't blown off by the wind. This is a serious coat...it doesn't mess around. It's a bit heavy but for the purpose of staying dry...it does what it is supposed to do. Rated 4 out of 5 by Calgal from stunning got this in white, which is a real eye-catcher and i get compliments every time i wear it. the only reason it didn't get 5 stars is b/c the collar comes up a little too high, so when it's buttoned all the way it either covers my chin, which looks dumb, or scrunches under my chin, which is uncomfortable... and i have a pretty long neck. the HUGE advantage over the competitor's model is the zipper closure in addition to the snaps, which really keeps you warmer and gives the coat neater lines. i usually wear size 2 or 4 and i got the XS, which fit perfectly. Rated 5 out of 5 by Odie from Rocking the Rain This is a true rain coat. Not one drop penitrates. Not terribly warm but I bought it for the rain not the winter. Love this coat. Wish they had more colors on sale though. Rated 5 out of 5 by momoloveshunter from Best Raincoat in the Market I recently moved to Seattle and needed to buy a raincoat since I am a few blocks away from work. I have an anorak rain jacket that I previously bought from another brand, but it was a bit too heavy and doesn't leave room for layering. I read a bunch of reviews on this before purchasing and I'm glad I made this purchase. I purchased the charcoal version and I have received so many compliments on it at work. I'm 5'2 and it hits me right at the knees. It provides a massive amount of coverage. It is definitely rain and windproof. I can wear this with only a sweater underneath the 30 degree weather and I'm still warm. The mesh lining inside keeps the coat from moving in the wind. This runs extremely large. I had to go down two sizes to a small. There is still an ample amount of room, but enough for layering, and not as baggy in appearance. Rated 5 out of 5 by Elle from Looks great Purchased for daughter, first day at school after Christmas got a ton of compliments! Rated 5 out of 5 by Snowbie from Excellent coverage during rain! It never rains in California! Thinks again, with the amount of rain we’ve had this year, I have really enjoyed using my rain coat! It does a wonderful job at keeping you dry! Rated 5 out of 5 by Rubia from Just as advertized Really cool and beautiful. Great rain resistance! !